Swimming pools come in all shapes and sizes, from merely mundane to mesmerizing pieces of art and architecture. It’s astounding what engineers and architects can do with swimming pools, just to give us humans some leisure and exercise. Rarely are pools actually necessary for us, but we love them nonetheless. While many of us manage to go for a dip at home, at the community pool, or while on vacation, the experience is more about getting in the water than it is about the pool itself. But there are some pools from various places spanning the globe that are attractions in and of themselves. These weird and wondrous structures (occasionally, Mother Nature’s own) are true marvels. Maybe if you’re fortunate you can plan a trip to one or more of these unique swimming holes. Badeschiff of Berlin, Germany. No, it’s not a “bathing ship”, but it is a shipping container which has been a pool since 2004. Berlin’s Spree River is, sadly, overly polluted and cannot be swum in. So, the Badeschiff Pool was constructed for the citizens of Berlin to enjoy clean swimming water. Open until midnight, this pool gets covered over after sunset so that the swimmers stay warm. Nothing beats German engineering! Blue Lagoon Geothermal Spa of Grindavik, Iceland. Blue Lagoon is one of the most beautiful places on Iceland, the land of mystifying geothermal features, and true to form this pool derives its alleged skin-healing superheated water from the ground close to a lava flow, which helps its temperature to hover constantly at about 100 degrees Fahrenheit. Furthermore, there’s a geothermal plant close by which is used to restore the lagoon every other day by way of a mixture of natural and artificial filtering. As the water gets heated naturally beneath the earth’s surface it becomes rich with minerals including sulphur and silica, to which are attributed the water’s amazing skin-healing powers. Conrad Rangali Islands of the Maldives. 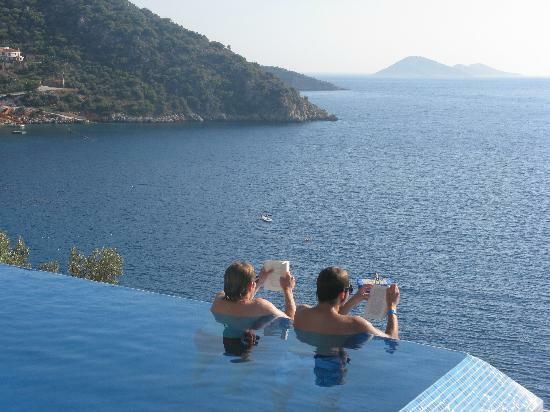 Here you will find infinity pools stretching off into the bluest of blue waters. Yes indeed, if you visit you will feel as if you could dive into infinite blue goodness at the Conrad Maldives Resort and Spa. Devil’s Pool at Victoria Falls, Mosi-oa-Tunya, Africa. This all-natural pool yields a spectacular view of one of the largest waterfalls (128 feet high) on Earth as well as of the beautiful Zambezi River. But why would this be the Devil’s Pool? It’s because the all-natural rock formation which prevents swimmers from being cast headlong and helplessly down the mighty Falls to their almost certain death cannot be seen from the banks, covered as they are by the Zambezi’s waters! How would you like to have been the guy to figure that out for the first time? 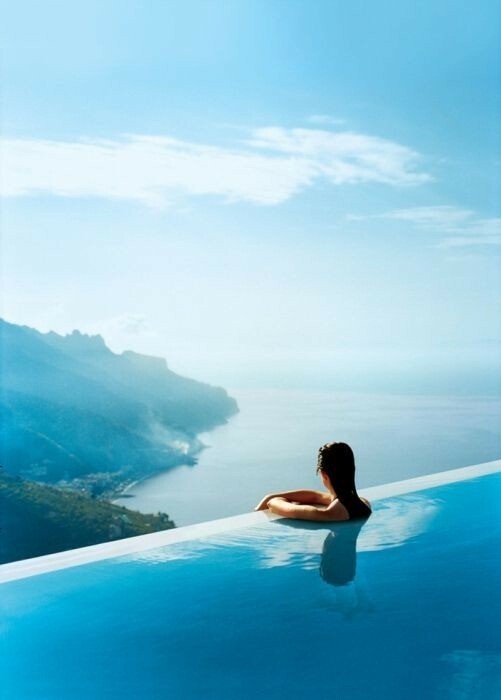 Hotel Caruso of Ravello, Italy. Situated upon the breathtaking Amalfi Coast the beauty of which is unsurpassed, this historic hotel (which once was a palazzo) features infinity pools where guests can luxuriate 1000 feet above sea level, drinking in the ineffable beauty of the landscape. Intercontinental Hotel of Hong Kong. Here, guests can find a series of three pools overlooking the city’s Victoria Harbor, situated atop the hotel’s third-floor spa deck. And, these three pools are each set to different temperatures—cold, warm, and hot—so that guests can submerge themselves in “perfect water” while soaking up the view of the gorgeous Hong Kong city skyline. The Library Blood-Red Pool of Koh Samui, Thailand. The Library is a posh resort built upon the Koh Samui beach, famous today for its lavish and intimate Full Moon Parties. But what’s this about a pool of blood-red water? It’s surely not really blood…but is it bacteria? Is it possibly poisonous dye? None of the above. The blood-red color of the water merely gets generated by the mixture of orange, yellow, and red tiles of which this luxurious pool is made. Nemo 33 of Brussels, Belgium. The world’s deepest indoor pool (divers can reach depths of 115 feet), Nemo 33 is filled with unfiltered spring water while being kept at a delicious 96 degrees Fahrenheit, which also means that divers don’t have to wear wetsuits here. In addition to recreational use which includes exploring realistic underwater “caves”, this pool is also host to diving training, Tour de France cyclist training, and the filming of underwater movie scenes. But the best part of this pool may just be the bar and restaurant all the way at the bottom of it! Ubud Hanging Gardens Hotel of Bali. As if the hanging gardens themselves aren’t enough, each villa has its own infinity pool wherein you could feel as if you’re about to dive off into the lush greenness. But you can also take the lower infinity pool to feel as if you can merge with the famous Balinese terraced gardens, some of the most ecologically astute gardens ever devised by mankind. So there you have it: 10 of the weirdest and most wondrous swimming pools on Earth. Next time you find yourself longing for adventure, as you float lazily in a more standard domestic aquatic option, close your eyes and imagine you’re actually perched weightless in water, high above the jungles of Bali. Jessie Zender is a freelance writer from Scottsdale, Arizona writing for www.roadrunnerpoolservice.com. Jessie writes extensively in the home maintenance field. He is considered an expert in the pool repair and pool cleaning service industries. The Ubud Hanging Gardens Hotel of Bali is my favorite. It is absolutely breathtaking and beautiful. 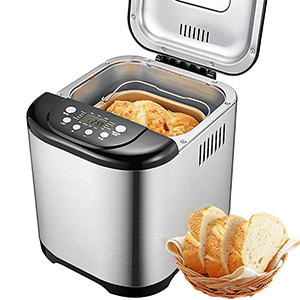 OH I SO LOVED THE ONE!!!! I LOVE POOLS & THESE ARE SOME OF THE MOST WONDERFUL EVER. SOME OF THE PICS WERE MISSING BUT I COULD SEE THEM FROM THE BLOG DESCRIPTION. THANKS THAT WAS WONDERFUL!!!! OMG that one from Belgium, gotta visit some day! Wow!I would like to go at Devil’s Pool at Victoria Falls, Mosi-oa-Tunya, Africa.. I don't know who came up with the concept but infinity pools rock! would love to visit all of these pools, especially the geothermal pools in Iceland. I'm all for the Icelandic geothermal spa! I would love to visit one of those! These pools certainly are weird. 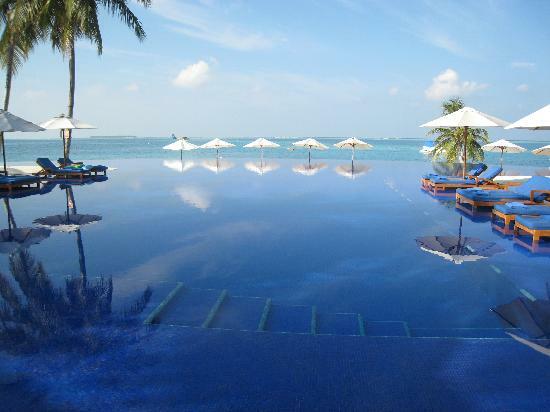 My fave was the infinity pool at the Conrad Maldives Resort and Spa. Thank you for this very interesting post. These are amazing! I'd love to visit some of these places in my lifetime, thanks for the share! Such an interesting post! You really did your homework for this!. They are absolutely magnificent! I would just love to go to any of these, especially the Devil’s Pool at Victoria Falls and the Ubud Hanging Gardens Hotel of Bali. Such a shame that they are all in different countries! I'd love to see the most interesting one in the US! I'll admit I don't understand the point of having a pool with the beach right there, but the red one is super cool. What beautiful swimming pools. I would be scared to swim in the Devil's Pool. What cool pools. I've seen the devil pool on a television show. I'm not sure about the red tiles. It's just not right. Kind of eerie. That one in Iceland looks pretty neat! Thanks for sharing this. These all look wonderfully inviting. Where most of them are located is so beautiful. I would love to go to Ubud Hanging Gardens Hotel of Bali and Conrad Rangali Islands of the Maldives. Wow, Jenn! What a great post! I want to visit every single one of these awesome pools. I really like the natural springs in FLorida...they're warm, like a nice soothing hot tub! 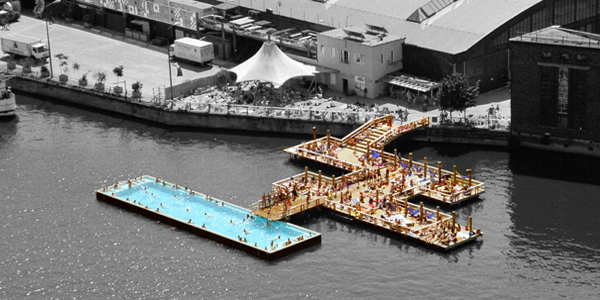 These pools may be weird, but they're fascinating at the same time. These are all so awesome - although the red pool is a bit disturbing. I know it is not really ed but I am not sure I could get in! Regardless, they all make my pool look like a kids plastic wading pool! Wow these are truly beautiful! I would love to swim in each one!! The Blue Lagoon in Iceland being my first choice! !